Reinventing yourself takes humor, heart, and a TON of footnotes! Max is a good kid—but you wouldn’t know that if you met him at the boring family camp his parents dragged him to over the summer. There, Max reinvents himself as “Mad Max” and gains a bad-boy reputation for being daring, cool, and fearless. But when Max returns home, he finds it’s easier to be fearless with strangers than it is among friends. 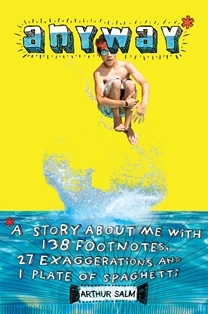 Peppered with humorous handwritten footnotes and doodles throughout, Anyway* perfectly captures the viewpoint of a young teen doing his best to find his place in the world—and an ideal balance between wise guy and wimp.